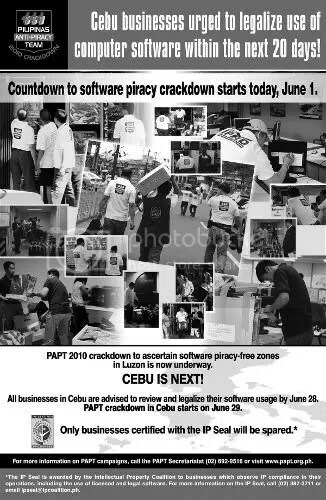 The ‘latest news’ dated June 1, 2010 at the PAPT website (see EDIT below) is entitled Cebu businesses warned to legalize use of software in 20 days to avoid PAPT raid: Only businesses awarded with the IP Seal will be spared. The 20-day grace period given by the Pilipinas Anti-Piracy Team (PAPT) in Cebu starts Tuesday, June 1, 2010 and will end on Monday, June 28, 2010. PAPT enforcement actions will resume on Tuesday, June 29, 2010. The PAPT composed of the National Bureau of Investigation (NBI), the Optical Media Board (OMB) and the Philippine National Police (PNP) earlier launched a nationwide campaign which seeks to map out software piracy-free zones across the country. Businesses in Cebu, i-cafés included, will be required to show the necessary proofs of licenses when the PAPT goes to their premises. The use of illegal software in the workplace is a violation of the Intellectual Property Code of the Philippines or IPR Law. In the same news release, NBI Director Nestor Mantaring made known that business establishments with the IP Seal will be spared from PAPT enforcement actions. The IP Seal is awarded by the Intellectual Property Coalition (IPC), a private entity, to businesses that observe compliance with the intellectual property laws in their operations, including the use of licensed and legal software. PAPT maintains a memorandum of understanding with the IPC which covers this provision. Finding the imposition of the IP Seal especially the fees that IPC charges unconscionable, there is now a movement called NO to IP Seal. The organizers of the movement emphasize that it is not against the anti-piracy campaign of the government. The movement is only against the IP Seal which is an imposition of a private entity in connivance with unscrupulous people in the agencies tasked to implement the IPR Law. What is your take on the IP Seal? EDIT: The link was pulled-down in the third week of June 2010 after the clamor against the imposition of the IP Seal as the basis of immunity against PAPT raids gained momentum. Click the image on this article and you will readily see such condition printed in the PAPT poster of the piracy crackdown. Seriously, what is wrong with our government? All these taxes and fees keep burdening the SMEs. It’s not enough that operating costs rise each year, they still have to impose such useless licensing measures. We regularly pay taxes, we pay permit fees, we oblige with laws and ordinances… what more do they need from us? And during times that we need them, especially on instances like burglary, holdups, etc…. they are practically useless. i think its just right to have those cafe’s with pirated OS/softwares raided it violates the IP law and ruins the IT industry.